Are you suffering from pain or decreased mobility? Ask your primary care physician or specialist today for a referral to physical therapy! Our PT can also help with Arthritis, Osteoporosis, Post-Surgical Care, Return to Work, or Low Back & Neck Pain. Contact Moab Physical Therapy & Rehabilitation. We can help. 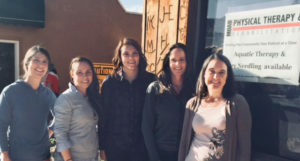 Moab Physical Therapy & Rehabilitation is proud to serve Grand County and the greater Moab, Utah area. Conveniently located in downtown Moab at 83 E. Center Street in the former Overlook Gallery. Please contact us for an appointment or more information. Cigna (all plans), Select Health (all plans), University of Utah Health Plans; Regence Blue Cross Blue Shield, Federal Employee Blue Cross Blue Shield, PEHP, United Health Care (UMR and GEHA); Aetna (only Altius merged plans); Educators Mutual Insurance (EMI) and MEDICARE plus all secondary supplement plans. Are we spending too much time sitting? Walk for the Health of It! Increased Fall Risk after Age 65, is it Preventable?